Networking in CloudStack 3.0 is awesome; the Virtual Router provides many cool features like LoadBalancing, PortForwarding, (s)NAT, DHCP, VPN and so on. When a new network is created and being used, a Virtual Router is automatically launched to support these features. Since the Virtual Router is a Single Point of Failure, you should turn on the HA (High Available) option; which actually addes a 2nd Virtual Router on each network. While this is pretty cool, it makes the number of System VM’s go up and when you don’t need them it’s kind of wasting resources. For example, when I was creating a network for the web servers to talk privately to the database, I didn’t need a Virtual Router. All I want is them to be able to do networking to each other and that is all. 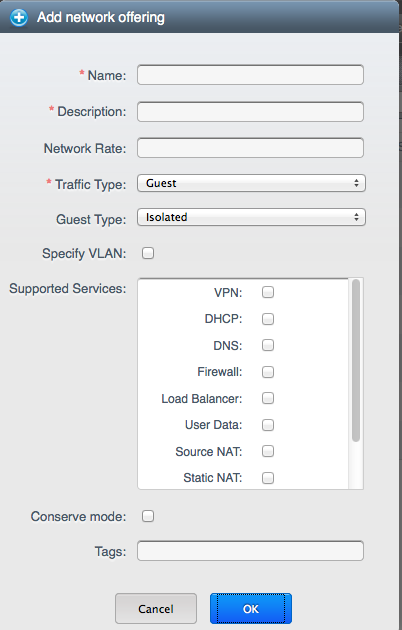 When using the default settings, a Virtual Router is launched anyway. So how to tell CloudStack you don’t need a Virtual Router? Well, this is done through Service Offerings. You find this option on the menu at the left, it’s the last option. Select Network Offerings and a list is displayed. Click Add Network Offering at the right and fill in the form. When you do not select any service, you’ll create a Network Offering for which CloudStack does not spin off Virtual Routers. Update: I’ve written another blog with more details on how to use this network. Also have a look at the comments in both blogs for some examples and idea’s. Feel free to ask me any questions you have below!